Potstickers are easy to fold if you know how. 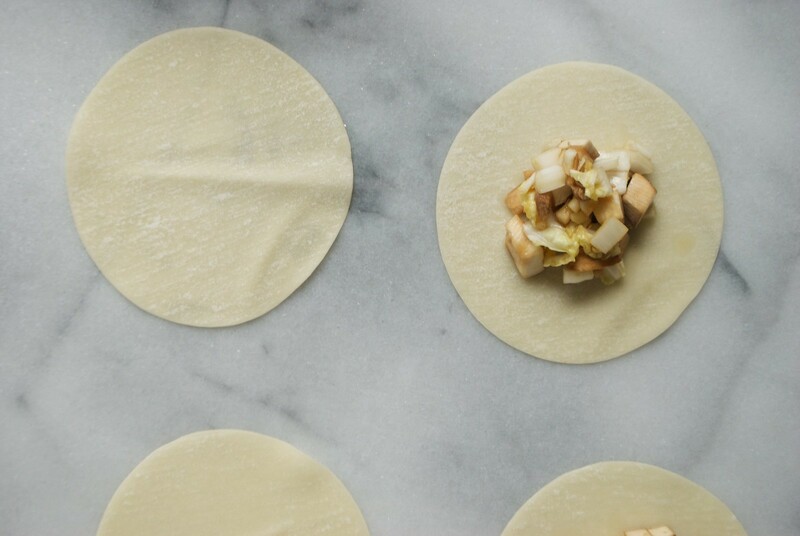 Lay out your potsticker wrappers and place a little filling in the middle. 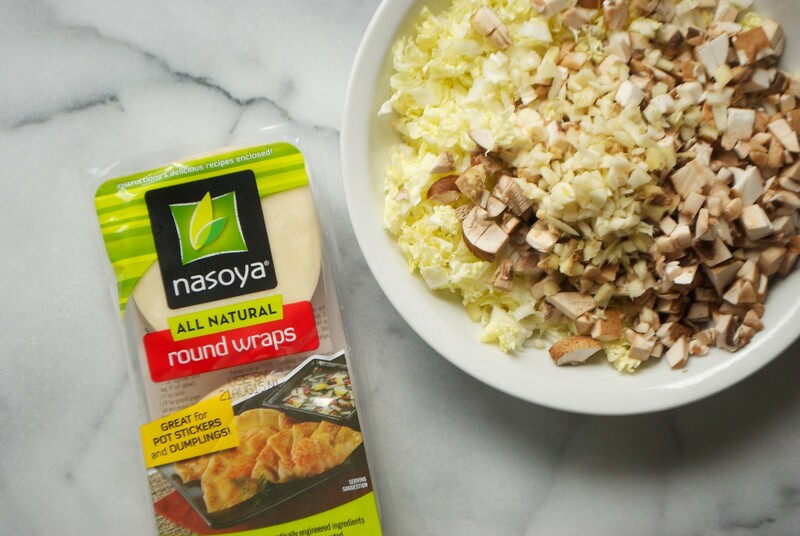 Not too much– you don’t want the filling to spill out as it cooks. Run a wet pastry brush or your finger dipped in water around the outer edge of the wrapper. Hold the wrapper in your palm, and use your other hand to pinch the potsticker closed. You’ll want to keep one side of the wrapper flat, and make folds in the other side of the wrapper as you fold it in. Press the wrapper closed to make sure everything is sealed. Your potsticker should now be able to stand upright, fold facing up. If that seems too complicated, you can just fold the wrapper in half and press it closed. You can now cook these potstickers, or freeze them. To cook them, heat a little oil in a nonstick pan with a lid. Nestle 10-15 potstickers in the pan without letting them touch. Let them cook on medium-high for 2-3 minutes, until the bottoms are just starting to turn golden brown. Then pour 1/3 cup or so of water into the side of the pan— gently to make sure the oil doesn’t splatter. Immediately put the lid on the potstickers, and let them cook for 4-5 minutes, until the top of the wrapper is no longer raw, and the filling is done to your preference. 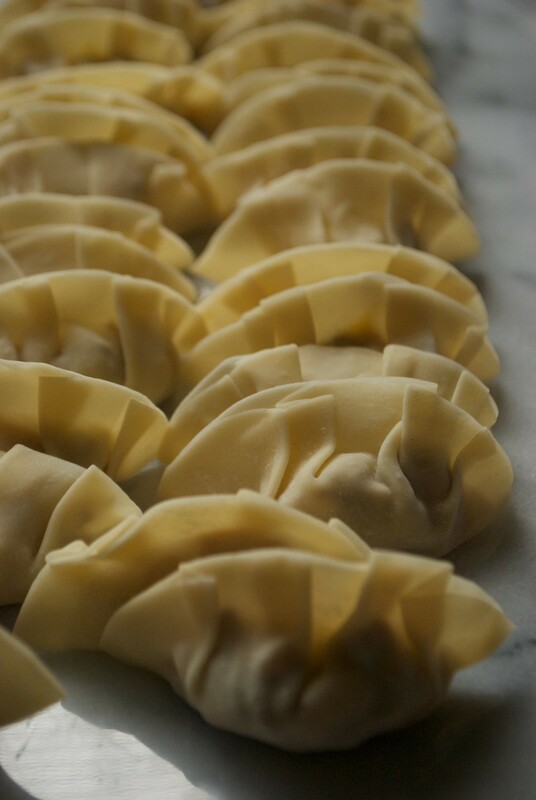 To freeze, place the potstickers on a baking sheet, spacing them out so they don’t freeze together. Put them in the freezer for several hours until frozen solid. Then move them to a plastic ziploc bag, or another sealed container, and store them for up to three months. Cook them as you normally would, without thawing. They may take an extra minute or two to crisp up or steam. And there! Veggie potstickers that are homemade, but also a quick frozen dinner for busy evenings. 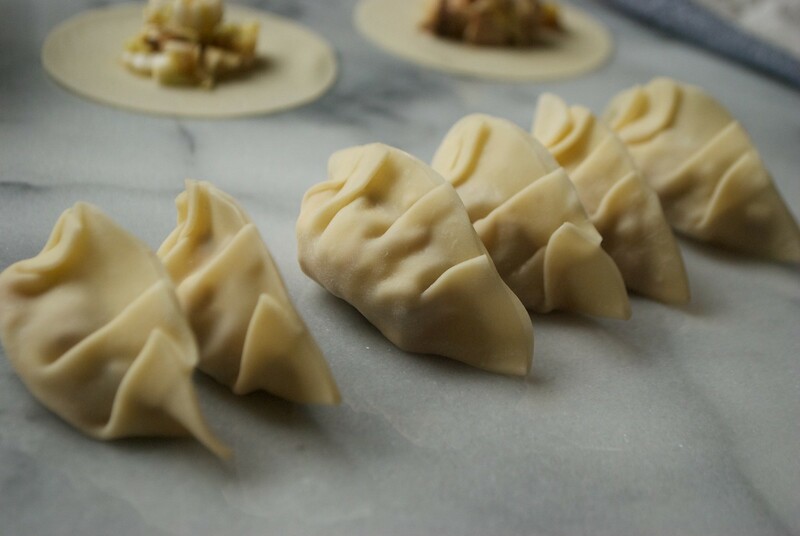 A simple, light potsticker recipe & instructions for freezing. Combine the cabbage, mushrooms, ginger, garlic, soy sauce, and red pepper flakes in a bowl. Let sit for five minutes. Take out a potsticker wrapper. Place a small spoonful of filling in the center, leaving at least a half inch of room around the outside of the wrapper. Run a wet pastry brush, or finger dipped in water, around the outer edge of the potsticker wrapper. Pinch the wrapper closed, being sure to seal the edges firmly. Heat a little oil in a nonstick pan with a lid. Add 10-15 potstickers to the pan and cook uncovered over medium-high heat for 2-3 minutes, or until the bottom of the potstickers is golden brown. Gently pour 1/3 cup water into the side of the pan, careful not to let the oil splash. Cover the pan, and let the potstickers continue to cook for about 5 minutes. Cook until the top of the wrappers are translucent and cooked through, and the filling is your preferred doneness. Place the potstickers on a baking sheet, spacing them out so they aren’t touching. Place in the freezer for 2-3 hours, until just frozen. 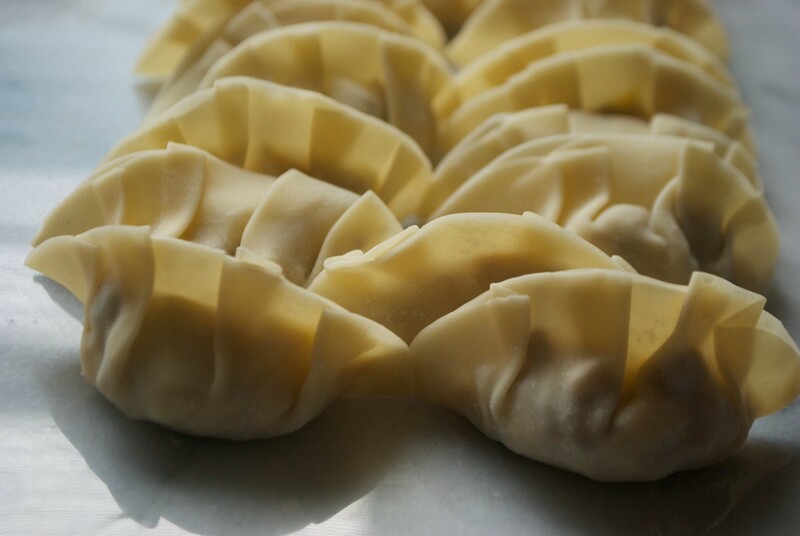 Transfer the frozen potstickers to a labeled zip-top bag or tupperware. Keep frozen for up to three months. Cook directly from frozen (without thawing) as you normally would, letting the potstickers brown and cook for a couple of extra minutes as necessary.